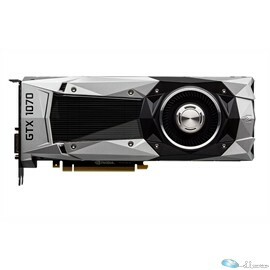 Info : PNY GeForce GTX 1070 8GB GDDR5 PCIE X16 DVI HDMI 3 x DP, PCI-E 3.0 x16, (3x) Display Port 1.4, HDMI 2.0b, DL-DVI. Take on today's challenging, graphics-intensive games without missing a beat. The PNY GeForce GTX 1070 graphics card delivers the incredible speed and power of NVIDIA Pascal the most advanced GPU ever created for truly revolutionary gaming and VR performance.